Industry analyst Doug Creutz says it will be a "black eye" for EA if Medal of Honor can't consistently pull down review scores of at least 85-90 percent. Review scores are a tricky thing. On one hand, they're so ridiculously over-inflated that anything less than a mid-80s percentage is considered a failure; on the other, reviewers don't dare buck that trend for fear of essentially scoring themselves out of the Relevant Reviewers Club. Remember a couple of years ago, when Ubisoft CFO Alain Martinez said, "When Assassin's Creed launched and got 82 percent, we were desperate, and we thought we were going to die?" Yet it sold like gangbusters, while the much-higher-rated Prince of Persia: The Sands of Time didn't even do half of AC's numbers. 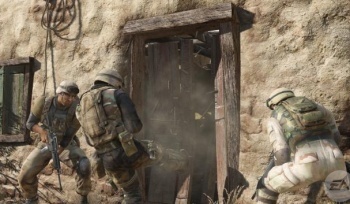 It all has a way of making review scores sound both pointless and meaningless, but Cowen and Co.'s Creutz nonetheless says that sub-par numbers for Medal of Honor, which these days means anything under 85 percent, could have a big impact on the game. "With the revamped Medal of Honor heralded as a presumptive challenger to Activision Blizzard's Call of Duty franchise in the important first person shooter genre, we were expecting review scores in at least the 85-90 percent range," he said. "Failing to achieve this target would be a bit of a black eye for EA management given the amount of focus and hype they have placed on the game," he continued. "We believe the mixed reviews could impact the title's legs as it will likely be competitively disadvantaged once Activision releases Call of Duty: Black Ops." Electronic Arts has already admitted that the Medal of Honor reboot won't beat out Black Ops over the holidays, but executive producer Greg Goodrich also claimed last month that the game needs to sell at least three million copies or there will be no sequel. Am I the only one who feels kind of sad about living in a world in which an aggregate review score in the low-to-mid-80s is just enough to consign a promising franchise to oblivion? Medal of Honor is out now for the PC, Xbox 360 and PlayStation 3.